Cancer cell lines are used to study tumor biology in vitro and as models for testing novel anticancer therapeutics. To date, the vast majority of studies in this field was done based on established cell lines that were cultured for decades. However, upon extensive in vitro propagation, cancer cell lines can undergo changes as they potentially acquire multiple genetic and epigenetic alterations, lose the heterogeneity present in the parental tumor, and tend to lack tumor-initiating as well as multilineage differentiation capacity. Consequently, classical tumor cell lines only insufficiently represent the characteristics of a tumor (PMID: 22068913). To generate improved models for cancer research, novel cell lines are derived from primary tissues and used at low passage numbers. However, this process is very inefficient for most tumor entities. In addition, most of the media used include large amounts of mostly undefined serum, which has been shown to exert a selective pressure leading to a reduction of clonal heterogeneity in primary tumor cell cultures. Moreover, serum drives primary tumor cells to a more differentiated state when used over multiple passages. (PMID: 17122771, 18371377, 16697959) Taken together, thus far there is a lack of methods and reagents allowing for an unbiased, non-selective culture of primary tumor cells. For this reason, Miltenyi Biotec developed instruments and reagents, including specialized media, to provide an optimized workflow for the initiation and maintenance of primary tumor cell lines with retained heterogeneity. 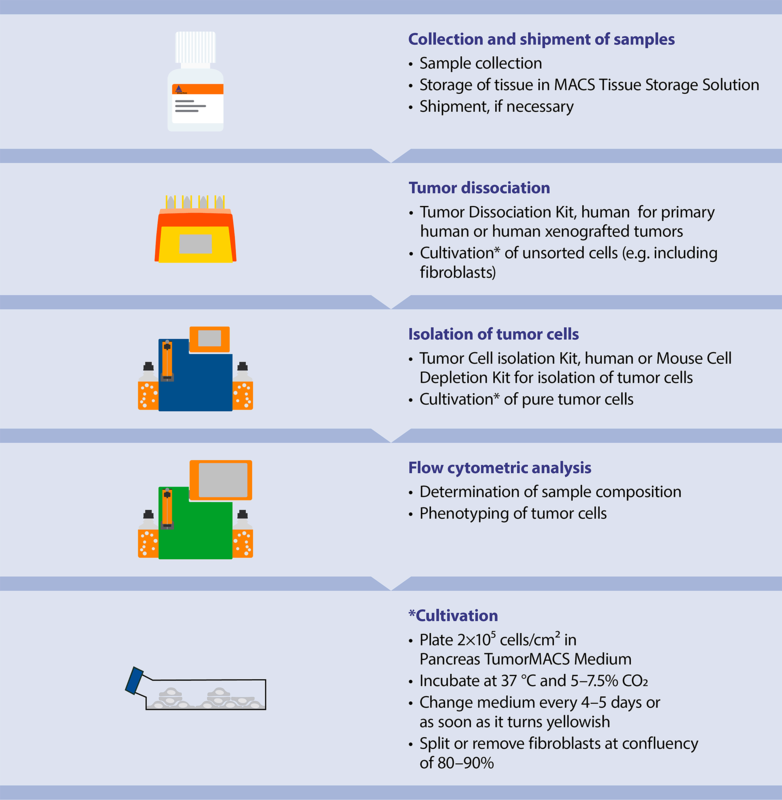 Figure 1 illustrates the workflow for the generation and culture of tumor cells, encompassing sample collection, automated tumor tissue dissociation, tumor cell isolation, flow cytometric analysis of isolated tumor cells, and ultimately the cultivation of tumor cells. A workflow for a pancreatic tumor cell line is shown by way of example. The workflow offers options to standardize various process steps such as tissue dissociation, seeding of purified tumor cells, and tumor cell propagation. One of the most crucial components within the workflow is the culture medium because it contributes eminently to the maintenance of cell culture stability and heterogeneity of the tumor cells. Figure 1: Workflow for the generation of a tumor cell line. Miltenyi Biotec designed specialized media, the TumorMACS Media, which enable the initiation and expansion of primary tumor cell cultures from epithelial tumors (PMID: 26855150). These media are serum free and have been optimized with regard to formulation, stability, and usability. To streamline the process of tumor cell culture, TumorMACS Media offer the flexibility to seed tumor pieces, single cells from bulk tumor, or pre-sorted populations of tumor cells. Notably, TumorMACS Media enable the unbiased growth of epithelial tumor cells, thus offering the gentle selection of cancerous cells while preserving the initial heterogeneity of the bulk tumor with regard to tumor cell subtypes. To address the diverse needs of different tumor entities, TumorMACS Media are optimized for different tumor types. At a glance: Miltenyi Biotec products supporting the entire workflow for the generation of tumor cell lines, from tissue storage and sample preparation through to cell culture and cryopreservation. Trademarks mentioned in the additional/optional materials section are the property of their respective owners and are used for identification purposes only. If tissue samples need to be shipped or cannot be processed immediately, they can be stored in MACS® Tissue Storage Solution. Optimal storage of fresh tissue samples prevents necrosis, apoptosis, and cell activation, which might otherwise compromise downstream analysis. Tumor tissue is dissociated using the gentleMACS™ Octo Dissociator with Heaters in combination with the Tumor Dissociation Kit, human. The kit contains all the reagents required for effective preparation of single-cell suspensions from tumor tissue. Enzymes of the Tumor Dissociation Kit are reconstituted according to the corresponding data sheet and can be aliquoted and stored at –20 °C for later use. The enzyme mix is prepared by transferring DMEM or RPMI medium and the appropriate volume of enzymes to a C Tube. Up to 1 g of tumor tissue can be processed using 5 mL of the enzyme mix. The protocol of the Tumor Dissociation Kit, human is designed for processing of 0.01–1 g of tumor tissue per preparation (use of 0.3–1 g of tissue leads to the best results). To start the preparation, adjacent non-tumor tissue is removed from the tumor biopsy sample, and the tumor tissue is cut into smaller pieces of approx. 2–4 mm in length. The pieces are then transferred to the C Tube containing the enzyme mix, and the C Tube is inserted into the gentleMACS Octo Dissociator with Heaters. Tissue is then processed automatically using the appropriate program specified in the data sheet of the Tumor Dissociation Kit. Depending on the tumor type and source, cutting pieces from the biopsy sample and seeding them directly without further treatment can result in successful initiation of a tumor cell culture. However, experience suggests that it is highly beneficial to treat the tissue with proteolytic enzymes prior to seeding. To this end, the tissue can be cut into larger pieces (>5 mm) and incubated with the enzyme directly. The tissue pieces can also be treated with the enzymes from the Tumor Dissociation Kit, human in combination with the gentleMACS Octo Dissociator with Heaters using program “37C_h_TDK_1” instead of the appropriate program specified in the data sheet. Regardless of the tumor type, this process will yield viable single cells. However, the single-cell yield can be significantly lower than with the optimized program and protocol of the Tumor Dissociation Kit, human, because larger tissue pieces will remain non-dissociated, which still can result in successful initiation of a tumor cell culture. After termination of the dissociation program on the gentleMACS™ Octo Dissociator with Heaters, a short centrifugation step (100xg for 10 sec) facilitates the collection of the cell suspension at the bottom of the C Tube. The pellet is loosened by carefully pipetting the sample up and down. After larger tissue pieces were allowed to settle by gravity, the supernatant, i.e., single-cell suspension, is transferred to a MACS® SmartStrainer (70 µm) placed on a 50 mL tube. When working with tissue amounts below 0.1 g, a 15 mL tube should be used instead. If the remaining tissue pieces will be used for cultivation without further dissociation, they are transferred from the mesh of the cell strainer into a 15 mL tube, washed with RPMI or DMEM, and centrifuged for 5 min at 300xg prior to seeding. After filtration, the single-cell suspension is centrifuged (300xg, 7 min), and cells are resuspended in an appropriate buffer for further processing or the respective TumorMACS Medium for direct plating (see section Plating of cells). At this point, the cell count should be determined, ideally by microscopy in combination with flow cytometry analysis. The latter can be used to exclude non-tumor cells from the cell count. During storage and in particular shipment of fresh tissue, some cells and even small cell aggregates might already have been released to the supernatant. These cells can give rise to primary tumor cell cultures quite efficiently. Therefore, after removing the tissue pieces from storage, the remaining MACS Tissue Storage Solution is centrifuged (300xg, 7 min) and the pellet resuspended in a small volume of the respective TumorMACS Medium for direct plating. The cell number should be determined, even if small cell aggregates are present. Removal of non-tumor cells from dissociated tumor tissue might be necessary, for example, when the primary culture will be directly used for drug testing where contaminating cell populations might bias the results. The Tumor Cell Isolation Kit, human and the Mouse Cell Depletion Kit enable the effective and fast enrichment of tumor cells from single-cell suspensions of primary human tumor samples and xenografted tumor material, respectively. The basic principle of magnetic cell separation by MACS® Technology underlying these two kits is illustrated in figure 2. Before and after isolation of tumor cells, the cell count needs to be determined (see section Collection of bulk tumor cells after dissociation). In addition, the purity of tumor cells can be determined by flow cytometry. Red blood cell lysis by hypotonic buffers is not recommended as this will lead to a significant loss of tumor cells (usually >50%) and a reduction of the viability rate. Figure 2: Scheme for the isolation of tumor cells from dissociated tumor tissue by depletion of non-tumor cells based on MACS Technology. The illustration exemplifies the procedure of the Tumor Cell Isolation Kit. The non-tumor cells are magnetically labeled with MACS MicroBeads. During separation, the unlabeled tumor cells are collected in the flow-through fraction whereas the non-tumor cells are retained within the magnetic field of the column. Optionally, the retained cells can be eluted after removal of the column from the separator. The procedure of the Mouse Cell Depletion Kit is very similar. In this case, mouse cells contained in the dissociated xenograft sample are labeled with MicroBeads. Human cells are collected in the flow-through fraction, and mouse cells are retained in the column. Ideally, cells are plated at a density of ≥2x105 tumor cells per cm2. To this end, cells are suspended in the appropriate volume of TumorMACS Medium. When plating cell suspensions from dissociated bulk tumor, large numbers of fibroblasts, leukocytes, or red blood cells can hamper proper plating of the tumor cells. In that case, isolation of tumor cells prior to plating can be beneficial (see section Tumor cell isolation). After plating, cultures should be inspected at least every other day. The medium should be replaced with fresh Tumor MACS Medium after 4–5 days at the latest or when the color of the medium turns yellowish. When tissue pieces are plated as well, the pieces are resuspended in TumorMACS Medium after centrifugation (see section Collection of bulk tumor cells after dissociation) and plated in appropriate dishes or flasks. In this case, an ideal seeding density cannot be determined easily. The cultures should be inspected daily during the first week, because large amounts of cells can quickly consume the medium. As soon as the medium turns yellow, it has to be replaced with fresh medium. For adherent cultures, the choice of cell culture ware can be crucial (fig. 3). Depending on the application or tumor type and source, the use of coatings (e.g. basement membrane matrix, collagen, or gelatin) can be beneficial. As the ideal culture substrate cannot be determined in advance, multiple types of plates and/or coatings should be tested, if possible. However, there is no need to test ultra-low attachment plates at this point. This is because Tumor MACS Media also support growth of suspension cultures, in which spheroid-like structures will spontaneously emerge if the intrinsic characteristics of the individual tumor can promote the formation of these structures (see figure below). This is of particular importance as even epithelial tumor cell samples might grow better in a suspension culture of spheroid-like structures than in adherent culture (fig. 4B vs. fig. 4A). Subsequently, the suspension cultures can be transferred to ultra-low attachment plates for further expansion (fig. 4C). 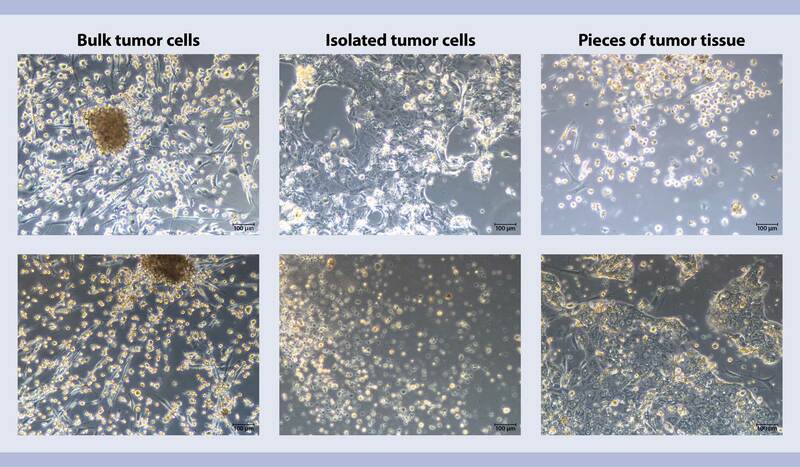 Figure 3: Tumor cells cultured in different cell culture plates. The images show cultured tumor cells previously isolated from a xenograft derived from a primary human pancreatic adenocarcinoma. The xenograft was dissociated using the Tumor Dissociation Kit, human and the gentleMACS Octo Dissociator with Heaters. Tumor cells were then isolated using the Mouse Cell Depletion Kit. Cells were plated on different cell culture plates in Pancreas TumorMACS Medium at the same density. On day 8, the cell cultures already showed differences depending on the culture ware or surface treatment chosen. Figure 4: Establishment of adherent or suspension culture. The images show two different cell lines, derived from the same primary pancreatic adenocarcinoma, growing in adherent or suspension culture. 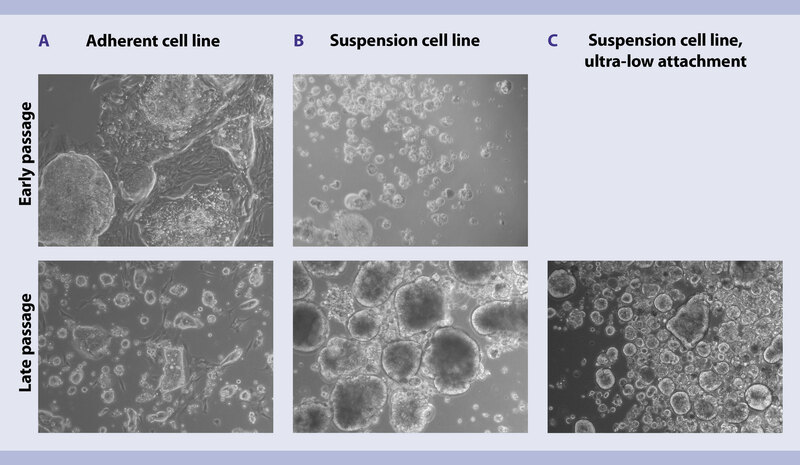 During initial cultivation of the primary tumor cells, some cells detached, grew in suspension (B), and gave rise to a separate cell line, distinct from the cells that kept their adherent characteristics (A). 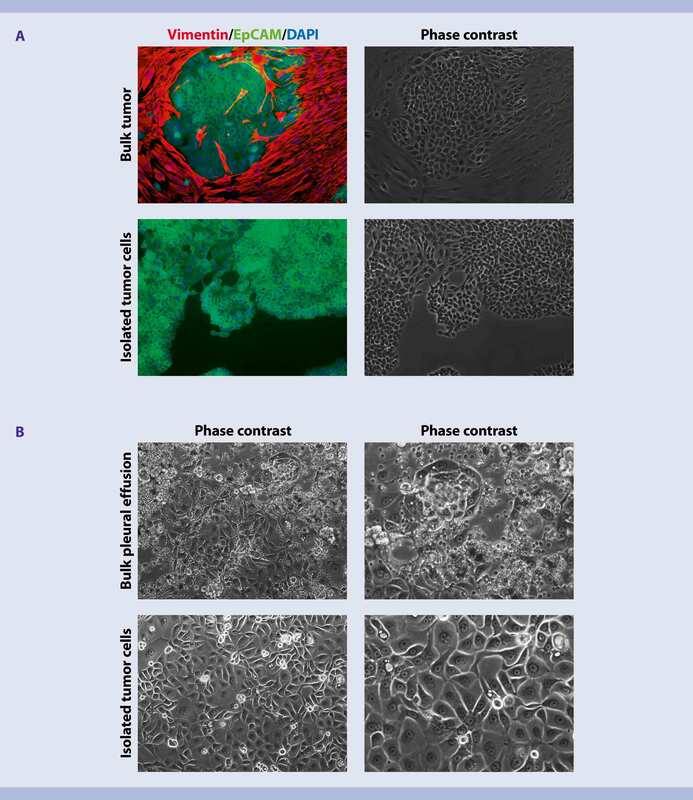 Pancreas TumorMACS Medium supported cell expansion both in adherent and suspension cultures. Remarkably, in the samples shown, the epithelial tumor cells grew better in a suspension culture of spheroid-like structures (B vs. A). The suspension culture could also be transferred to ultra-low attachment plates fur further expansion (C). Primary tumor cells are very heterogenous regarding their plating behavior in vitro, even if they were derived from the same tumor entity. One of the most critical factors that need to be considered to achieve efficient plating is cell density. As epithelial tumor cells almost never attach and proliferate if seeded at low concentrations, the plating density should be at least 2×105 tumor cells per cm2. If large numbers of, e.g., fibroblasts, leukocytes, or red blood cells are observed, isolation of tumor cells prior to plating can be beneficial (see section Tumor cell isolation). While red blood cells and cell debris impair effective plating of tumor cells, fibroblasts attach and expand more efficiently, thereby overgrowing the tumor cells. Even when the tumor cells attach and grow well in the presence of non-tumor cells, in vitro cell culture assays (e.g. drug cytotoxicity testing) of these tumor cells become problematic since mathematical correction for effects originating from contaminating cells is impossible in most cases. Additionally, results from molecular analysis could be distorted by non-tumor cells present in the sample. Isolation of tumor cells enables effective plating and the initiation of a homogeneous culture (fig. 5). Figure 5: Isolation of tumor cells provides substantial benefits for cell culture. Plating of human tumor cells from primary specimens is frequently hampered by the presence of fibroblasts, red blood cells, and debris. This can be avoided using isolated tumor cells for culturing. In the experiment shown in the left part of the figure, breast tumor tissue was dissociated with the Tumor Dissociation Kit, human using the gentleMACS Octo Dissociator with Heaters. Upon magnetic separation using the Tumor Cell Isolation Kit, human, the isolated tumor cells were cultured for seven days, fixed, and stained for a fibroblast marker (vimentin) and the human-specific tumor marker CD326 (EpCAM) (A). Bulk tumor cells were cultured for comparison (A, upper panel). Even after seven days of culture, a nearly pure population of human tumor cells was observed in the fraction of isolated tumor cells (A, lower panel). Moreover, cultivation of an ovarian cancer pleural effusion sample for three days with and without prior tumor cell isolation clearly indicated the benefit of removal of debris and non-tumor cells, as reflected in homogeneous cultures (B). Different types of tumor cell samples (e.g. tumor pieces, bulk or isolated tumor cells) from the same tumor entity can show considerable differences in plating efficiency (fig. 6). Accordingly, it is recommended to plate multiple sample types of every tumor specimen, if possible. Figure 6: Tumor cells from two different xenografts derived from primary pancreatic adenocarcinoma. Prior to culture, xenografts were cut into pieces and treated with protease (right) or dissociated using the Tumor Dissociation Kit, human (left). Alternatively, tumor cells were isolated from the dissociated xenografts by the Mouse Cell Depletion Kit (middle). Cells from the tumor xenograft shown in the upper panel displayed the best plating efficiency when isolated tumor cells were used for the culture, whereas the xenograft shown in the lower panel grew best when pre-digested tissue pieces were seeded. Within the first 7–14 days, the medium should be replaced when it turns yellowish, but at least every 4–5 days. Typically, adherent cells will attach within the first 2–4 days. Nevertheless, during the initial media changes the supernatant should not be discarded as this fraction may still contain viable tumor cells, which can be recovered by centrifugation. After resuspending the cells in fresh TumorMACS Medium, they can be transferred back to the culture vessel with the initial culture. Alternatively, the entire supernatant can be transferred to a fresh culture vessel. However, this might lower the plating/growing efficiency of the tumor cells. Because Tumor MACS Media also support growth of suspension cultures, spheroid-like structures may emerge in the supernatant if the intrinsic characteristics of the individual tumor allow it. As already mentioned in the section Culture ware surfaces and coatings, some samples of epithelial tumor cells might even grow better in a suspension culture of spheroid-like structures than in an adherent culture (figs. 4 and 7). However, to establish a stable suspension culture it is important to analyze whether the cells in the supernatant are still viable. This can be done by microscopy using a dye that labels dead cells, such as trypan blue or erythrosine B, or by flow cytometry. If viable cells are detected in the supernatant, the cells should be concentrated by centrifugation and re-seeded in fresh TumorMACS Medium. Larger aggregates can be dissociated during re-seeding (see section Passaging primary cultures). During the initial phase of the culture, aggregates should be dissociated by pipetting in order to obtain smaller spheroid-like aggregates. If aggregates or spheroid-like cultures are dissociated into single cells prematurely (e.g. by using proteases), the primary culture might stop proliferating and die. Accordingly, dissociation into single cells is only an option after the cell culture has been established as suspension culture and passaged multiple times. Figure 7: TumorMACS Medium supports cell expansion both in adherent and suspension cultures. The images show two different cell lines derived from a colon carcinoma xenograft. During initial cultivation, the tumor cells grew as adherent culture (A). Upon further propagation, some cells detached, grew in suspension (B), and gave rise to a cell line distinct from the cells that kept their adherent characteristics. Subsequently, the suspension culture was separated from the adherent fraction and transferred to ultra-low attachment plates for further expansion (C). TumorMACS Medium supported cell expansion both in adherent and suspension cultures. This is of particular importance, as the data show that for some specimens even epithelial tumor cells can exist in both suspension and adherent culture (B) or even grow better as suspension culture of spheroid-like structures. As discussed above, the use of media containing large amounts of mostly undefined serum has been shown to exert a selective pressure. This leads to a reduction of clonal heterogeneity in primary tumor cell cultures and drives primary tumor cells towards a more differentiated state when used over multiple passages. Another drawback of using serum is that it strongly promotes the growth of tumor-associated fibroblasts, thus increasing the risk of losing the primary culture as a result of fibroblast overgrowth (fig. 8). However, serum can accelerate the initial attachment and expansion of tumor cells from some primary tumor samples, in particular less aggressive tumors. Therefore, it might be beneficial to include one culture well using TumorMACS Media supplemented with 2.5% or 5% fetal calf serum (FCS). As soon as a primary tumor cell culture has been established, the culture can be adapted to serum-free medium by serial reduction of the FCS content. Figure 8: Addition of serum to the culture enhances fibroblast growth. Bulk tumor cells from a dissociated primary ovarian carcinoma were plated in Ovarian TumorMACS Medium with or without 5% FCS. Addition of FCS (right) increases the proliferation rate of fibroblasts considerably, whereas the culture without FCS (left) is almost devoid of fibroblasts. For initial plating (or upon thawing of cryopreserved primary tumor cells), the addition of inhibitors of Rho-associated kinases (ROCK) can significantly enhance survival and plating efficiency (fig. 9). Different ROCK inhibitors can be used for this purpose. The ROCK inhibitor (e.g. 10 µM Y-27632) should be removed after 48 hours by replacing the medium. Moreover, during the first passages, ROCK inhibitors can enhance re-plating. Figure 9: Plating efficiency and survival of tumor cells can be significantly enhanced by addition of ROCK inhibitors. The images show a tumor cell culture derived from a pancreas carcinoma xenograft 48 h after thawing. Tumor-associated fibroblasts are thought to support tumor progression. (PMID: 28974764, 28368410, 28927027) Accordingly, they can also support tumor cell growth in vitro. Yet, they frequently tend to overgrow tumor cells resulting in loss of the desired primary tumor cell culture. When the percentage of fibroblasts is higher than that of adherent tumor cells after 5–10 days of culture, the fibroblasts should be gently removed. This can be accomplished by adding Accutase solution or trypsin/EDTA and incubating the culture for 0.5–1 min intervals at 37 °C (fig. 10). After each interval, the culture should be inspected using a microscope. Fibroblasts usually detach faster than tumor cells. As soon as the fibroblasts start to detach while the tumor cells still adhere to the culture dish, the supernatant should be aspirated. The culture is then gently washed by addition of albumin-containing buffer (e.g. D-PBS, 1% BSA or HSA, and 2 mM L-glutamine), short incubation at room temperature, and aspiration of the buffer. Subsequently, fresh TumorMACS Medium is added to the culture. An alternative approach is to remove all non-tumor cells, including fibroblasts, by MACS® Technology during passaging of primary cultures. For more details, please refer to the next section Passaging primary cultures. Figure 10: Fibroblasts starting to overgrow the tumor cell culture can be removed by treatment with proteolytic enzymes. A primary culture of colon carcinoma cells grown in TumorMACS Medium showed a considerable percentage of fibroblasts at day 10 after plating (left). The culture was treated with Accutase solution for 2 min to detach fibroblasts from the culture vessel (middle). After removing the supernatant and washing the culture with albumin-containing buffer, the culture was virtually free from fibroblasts. Primary tumor cell cultures should not be passaged until they have reached a confluency of at least 70%. When the cultures have reached this level of confluency, they should be split at a 1:1 ratio, or, if the cultures were highly confluent, at a ratio of 1:2. In detail, the supernatant is aspirated and Accutase or trypsin/EDTA solution added. Optionally, before adding the enzyme the culture can be washed with pre-warmed D-PBS. Incubation with the enzyme then occurs at 37 °C. The detachment process should be monitored closely under a microscope. As soon as the cells start to detach, the culture vessel should be tapped to facilitate detachment. Cells are harvested and transferred to a tube. Residual cells are recovered by washing the flask or plate with the same volume of albumin-containing buffer (e.g. D-PBS, 1% BSA or HSA, and 2 mM L-glutamine) and transferred to the same tube. Cells are centrifuged at 300×g for 5 min. After removal of the supernatant, cells are resuspended in fresh TumorMACS Medium by gentle pipetting and transferred to a new culture vessel. The initial passage will give an idea of the plating efficiency and proliferation rate of the tumor cells. Based on these observations, the subsequent passage can be performed at a ratio of 1:2 or 1:3. Yet, the cells should only be passaged after they have reached a high level of confluency. Moreover, even after the first successful passages, a 1:3 splitting ratio should not be exceeded as this might still cause crisis periods and starvation of the cell culture. In addition, during the first few passages, the addition of a ROCK inhibitor might be beneficial (see section ROCK inhibitors). If spheroid-like, floating tumor cell cultures form during the initial phase of cultivation, aggregates should be dissociated by pipetting in order to obtain smaller spheroid-like aggregates. For expansion the smaller aggregates are diluted with fresh TumorMACS Medium at a ratio of 1:2 or they are centrifuged and resuspended in twice the volume of the initial culture. If aggregates or spheroid-like cultures are dissociated into single cells prematurely (e.g. by using proteases), the primary culture might stop proliferating and die. Accordingly, dissociation into single cells is only an option after the cell culture has been established as suspension culture and passaged multiple times. If fibroblasts start to overgrow the cultures during the expansion of tumor cells, fibroblasts should be removed during passaging. Two options are available: i) Fibroblasts can be washed off after addition of a proteolytic enzyme to the culture (see section Fibroblasts in tumor cell cultures), or ii) fibroblasts can be removed from the culture by MACS® Technology which enables gentle depletion of non-tumor cells, including fibroblasts. For the removal of fibroblasts from cultures derived from xenografted tissue, the Mouse Cell Depletion Kit is the method of choice (fig. 11). The Tumor Cell Isolation Kit, human enables depletion of non-tumor cells from cell cultures derived from primary human material. Figure 11: Removal of mouse fibroblasts from a culture derived from a renal clear-cell carcinoma xenograft. The Mouse Cell Depletion Kit was used to remove all mouse cell types, including fibroblasts, during passaging of the cells. TumorMACS Media are designed for serum-free cultivation of tumor cells. Therefore, cryopreservation should also be done under serum-free conditions. We recommend using the animal component–free and chemically defined StemMACS™ Cryo-Brew for optimal storage of tumor cell cultures and cell lines as well as tumor cells obtained from dissociated tissue. For cryopreservation, tumor cells are harvested at a confluency of approx. 70–80% as described in section Passaging primary cultures, and the cell number is determined. After centrifugation, the supernatant is discarded, and the pellet is resuspended in StemMACS Cryo-Brew at a density of 106 cells/mL. Next, the cells are transferred to appropriate cryogenic vials and placed into isopropanol-based freezing containers. The cells are frozen for at least 24 h at –80 °C before transferring them to liquid nitrogen for long-term storage. Notably, if tumor cells grow as spheroid-like suspension cultures, aggregates should not be dissociated into single cells prior to freezing, as this might impair thawing and re-plating considerably. Spheroid culture should rather be dissociated into smaller aggregates by pipetting and cryopreserved in StemMACS Cryo-Brew as described above (without determination of the cell count). Notably, when thawing the tumor cells after cryopreservation, it is recommended to add a ROCK inhibitor (e.g. 10 µM Y-27632) for the first 48 h of cultivation (see section ROCK inhibitors). Long-established tumor cell lines were propagated and cultivated in standard media over the course of decades. They have been used as in vitro models of (pancreatic) cancers in efficacy and toxicity studies for novel therapeutic approaches. (PMID: 22068913) These studies have demonstrated the poor predictability of such models, leading to high failure rates of in vitro approved hits at preclinical and clinical stages. 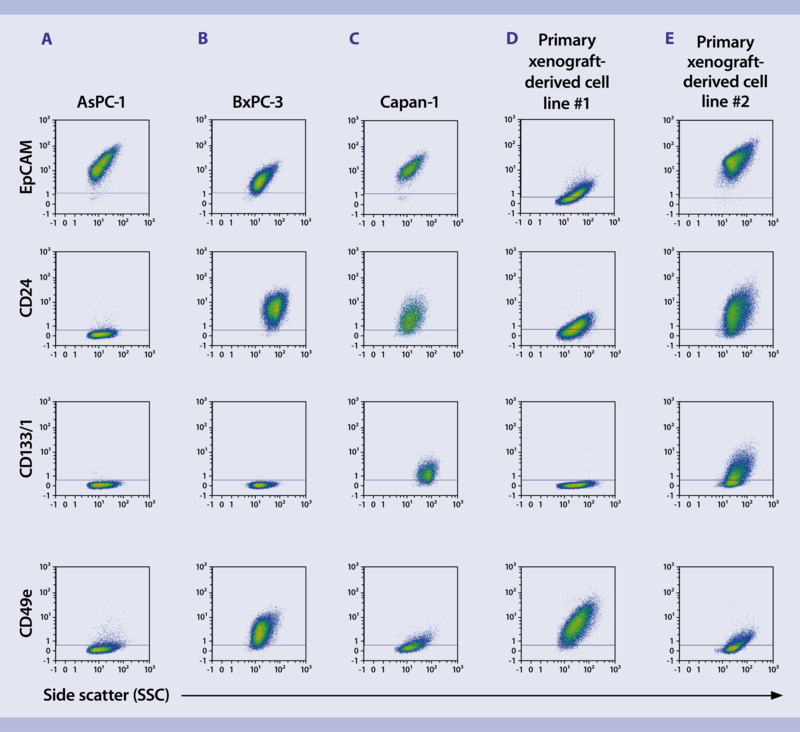 (PMID: 22068913) Flow cytometry analysis of established pancreatic tumor cell lines (AsPC-1, BxPC-3, and Capan-1; fig. 12A–C) indicated a homogeneous phenotype, as cells were either entirely positive for a certain marker of interest or not. Thus, these in vitro models lack the capacity to mirror the heterogeneity of patient tumors. In contrast, cell cultures generated in Pancreas TumorMACS Medium were heterogeneous, encompassing subpopulations for several markers (fig. 12D–E). Consequently, the de novo generated cell cultures and stable lines derived from these primary cultures more closely resemble the heterogeneity found within patient tumors. 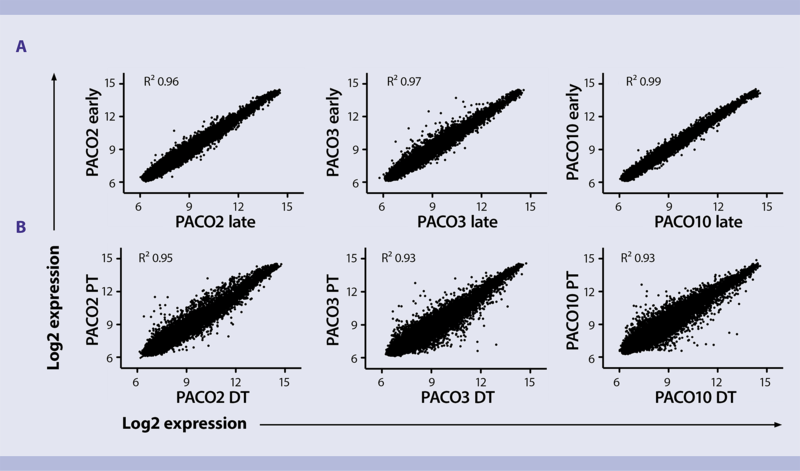 Figure 12: Flow cytometry–based analysis of established pancreatic tumor cell lines compared with cell cultures generated in Pancreas TumorMACS Medium. Pancreatic tumor cell lines are shown in A–C, cell cultures established in Pancreas TumorMACS Medium in D–E. The cultures showed an intrinsic heterogeneity with a heterogeneous phenotype and encompassed subpopulations for several markers. Sophisticated studies such as biodistribution analyses can only partly be modeled in vitro. Accordingly, there is a huge demand for relevant in vivo models closely resembling a patient tumor. For this purpose, xenograft models have been derived from traditional pancreas tumor cell lines. However, these cell line–derived xenografts failed to reflect the histological and functional features of primary human tumors (PMID: 26855150) because they showed a homogeneous appearance in histological tests (fig. 13A). In contrast, cell lines derived from primary tumors and propagated in Pancreas TumorMACS Medium retained their initial heterogeneity. After xenotransplantation, these cell lines closely resembled the parental patient tumor in histological analyses (fig. 13B). Pancreas TumorMACS Medium thus provides the opportunity to generate 2D in vitro models, which can also be used to set up xenograft models that closely and reliably resemble the initial patient tumor. Therefore, these models should provide a higher predictive power for in vitro as well as in vivo studies. 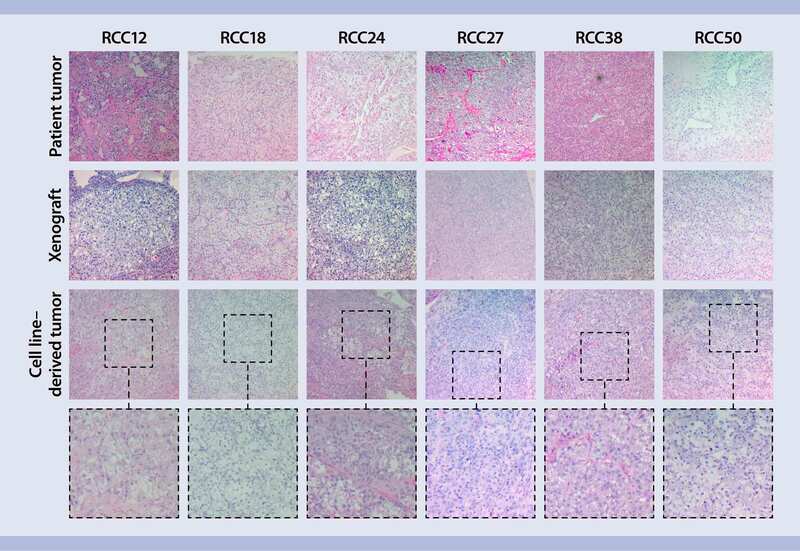 Likewise, tumor cells obtained from xenografted material and cultured in Renal or Ovarian TumorMACS Media also retained the parental tumors’ characteristics (figs. 14 and 15) and showed complex histological structures like the primary patient tumors. Figure 13: Tumor cell cultures in Pancreas TumorMACS Medium retain the characteristics of the initial tumor. Cell line–derived xenografts (PANC1 and BxPC-3) failed to reflect the histological and functional features of primary human tumors (PMID:17122771 ) as these cell lines had a homogeneous appearance in histological tests (A). 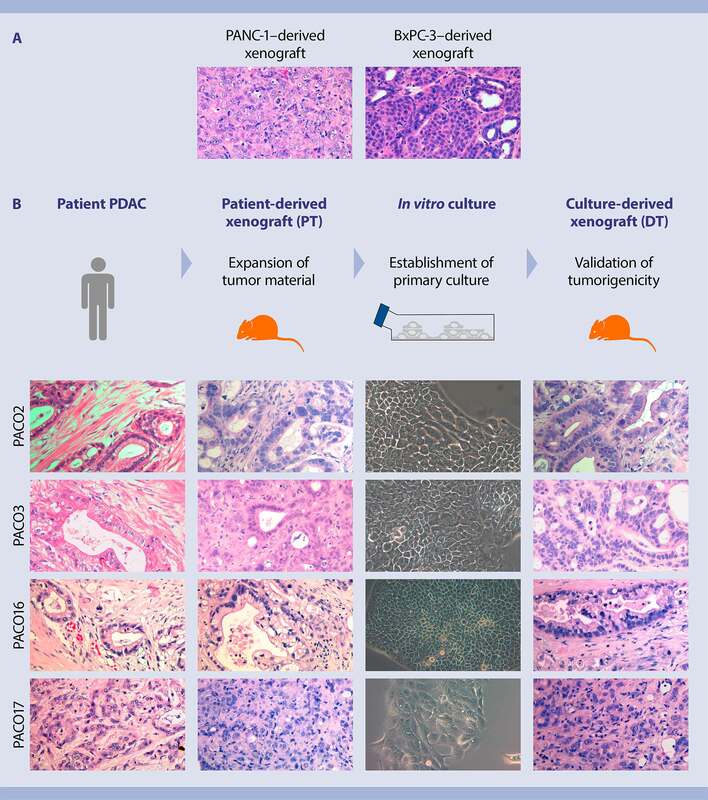 In contrast, tumor cells cultured in Pancreas TumorMACS Medium retained the characteristics of the initial adenocarcinoma tumor as shown by comparing culture-derived xenografts (PAC02, PAC03 PAC016 and PAC017) to the initial patient tumors (B). Figure 15: Tumor cells cultured in Ovarian TumorMACS Medium retain the characteristics of the initial tumor. 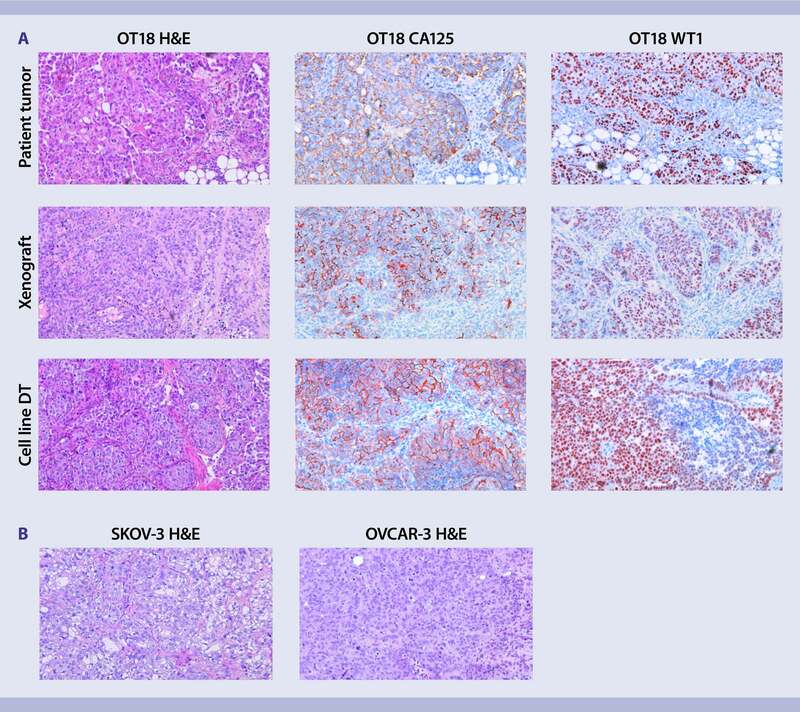 H&E, CA125, and WT1 stainings of primary ovarian tumors from a patient (A, upper row), patient tumor–derived xenografts (A, middle row), and cell line–derived xenograft tumors (A, lower row and B) were compared by microscopy. 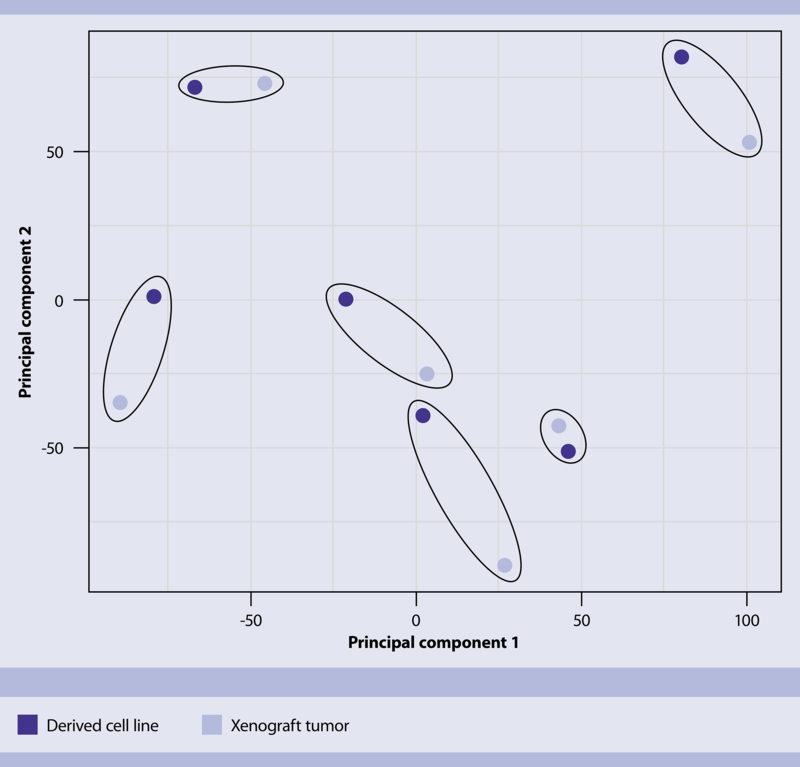 Tumor cells cultured in Ovarian TumorMACS Medium retained the characteristics of the initial tumor as shown by comparing culture-derived xenografts to the initial patient tumors. In addition, the ovarian cancer–specific markers CA125 and WT1 were well preserved in cell line–derived xenografts (A). In contrast, tumors derived from classical cell lines SKOV-3 and OVCAR-3, cultured in serum-containing medium, had a very homogeneous appearance, lacking histological characteristics of primary patient tumors (B). Scale bar: 100 µm. Long-term propagation of tumor cell lines in vitro harbors the risk of inducing bias in gene expression profiles, thus resulting in the divergence from parental tumors. To test for the genetic stability of cell lines generated and propagated in Pancreas TumorMACS Medium, gene expression profiles of early (p5) and late (p15) passages of the respective cell lines were analyzed (fig. 16A). High correlation coefficients clearly demonstrated that the global gene expression profile was maintained upon long-term cultivation in Pancreas TumorMACS Medium. Likewise, when cell line–derived, xenotransplanted tumors were compared to the initial patient tumors, the high level of correlation again demonstrated the preservation of genetic features (fig. 16B). Figure 16: Global gene expression analysis shows that tumor cell lines generated in Pancreas TumorMACS Medium are stable upon in vitro propagation and xenotransplantation. Whole genome expression profiling indicated high correlation coefficients between early versus late passages (A) as well as between primary tumors (PT) and cell line–derived tumors (DT) (B) for three independent pancreatic adenocarcinomas. Gene expression profiles of early (passage 5) and late (passage 15) passages of the respective cell lines were analyzed. High correlation coefficients clearly demonstrate that the global gene expression profile is maintained upon long-term cultivation in Pancreas TumorMACS Medium (A). Likewise, the high level of correlation of cell line–derived xenotransplanted tumors (DT) to the initial patient tumors (PT) shows the preservation of genetic features (B). Besides gene expression also the epigenetic signature of tumor cells is at risk of being unstable during long-term propagation in vitro. To evaluate the stability of the epigenetic status, six cell lines were compared to the original patient–derived xenograft tumors by methylation profiling microarrays (PMID: 25262207). The corresponding tumor / cell line pairs clustered, which indicated a high epigenetic stability upon culture in TumorMACS Media (fig. 17). Figure 17: Methylation profiling microarray analysis shows that tumor cell lines cultured in TumorMACS Media are epigenetically stable upon in vitro propagation. Principal component analysis showed that xenograft tumor / cell line pairs (indicated by red ellipses) clustered together for six independent pancreatic adenocarcinomas. Unless otherwise specifically indicated, Miltenyi Biotec products and services are for research use only and not for therapeutic or diagnostic use. gentleMACS, MACS, the MACS logo, MACSQuant, REAfinity, and StemMACS are registered trademarks or trademarks of Miltenyi Biotec GmbH and/or its affiliates in various countries worldwide. All other trademarks mentioned in this document are the property of their respective owners and are used for identification purposes only. Copyright © 2019 Miltenyi Biotec GmbH and/or its affiliates. All rights reserved.